Salami Suicide: Processed Meats Linked To Heart Disease And Cancer : The Salt Love that bacon, but realize that porking up on processed meat ups the risk of cancer and heart disease. That's the word from a big new study that tracked the eating habits of almost a half-million Europeans over 20 years. Bacon and bologna are hardly health food. But a huge new study offers the strongest evidence yet that eating processed meat boosts the risk of the two big killers, cancer and heart disease. A multinational group of scientists tracked the health and eating habits of bacon-loving Brits, wurst-munching Germans, jamon aficionados in Spain, as well as residents of seven other European countries — almost a half-million people in all. They found that people who ate a lot of processed meats — more than 20 grams a day, the equivalent of one thin strip of bacon — were much more likely to die of heart attacks and stroke, and also had a higher cancer risk. The more processed meats they ate, the greater the risk. That's not a huge surprise. Processed meats are notoriously high in fat, which increases the risk of heart disease and stroke. And this study squares with others on the risks of processed meats, including one 2012 study that found that people who ate one serving of processed meat a day increased their risk of death from cancer and heart disease by 20 percent; while people who ate red meat once a day increased their risk by 13 percent, compared with people who ate very little meat. The new European study didn't find the same risk from red meat, which is a bit of a surprise. Study leader Sabine Rohrmann, a professor of epidemiology at the University of Zurich, said that may be because the salt, smoke and nitrate used to preserve meats can increase the risk of cancers. The study followed its many participants from the 1990s to the 2000s. It was published Wednesday in the journal BMC Medicine. 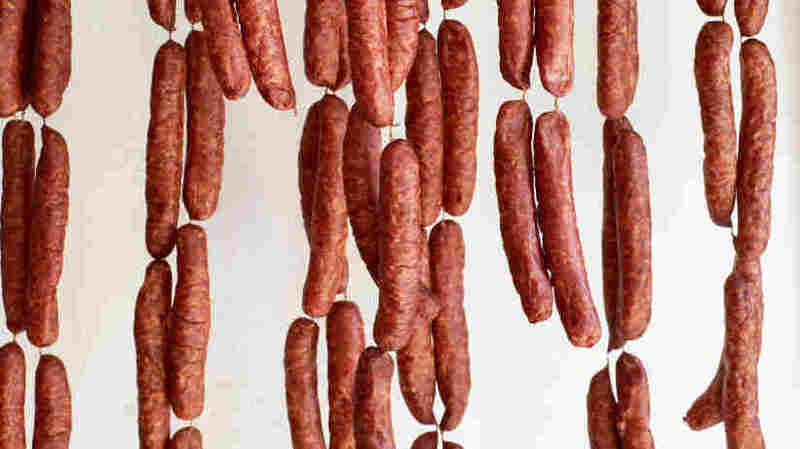 It could also be that sausages and other preserved meats can have amazingly high amounts of fat — some salamis are 50 percent fat. But it's not just about salty, fatty meat; it's about lifestyle, too. People in the study who ate sausages and ham tended to eat less fruits and vegetables, and they also were more likely to smoke, drink alcohol and skip exercise. The researchers tried to account for that, but say they might not have captured every nuance in diet differences between high-meat and low-meat consumers. If you need more proof, this follows hot on the heels of a study that found that the Mediterranean diet — lots of olive oil, nuts, fish and veggies, and very little red meat — reduces the risk of heart attack and stroke. OK, OK, we got the message. Does this mean renouncing the joys of bacon and eggs, or bangers and mash? Rohrmann is sympathetic. "My recommendation is to limit meat intake, in particular processed meat intake," she told The Salt via email. "However, we know that meat is rich in some vitamins and minerals and, thus, my recommendation is to limit the [total] amount of meat to about 300 to 600 grams a week." That's a little over a pound, at the upper limit. And what about bacon, that lovely salty, fatty substance that's been dubbed the gateway meat for vegetarians? "I'd say it's fine to eat bacon and sausages," says Rohrmann, "but not in high amounts and not every day."